Eating one ounce of mixed nuts (raw unpeeled walnuts, almonds and hazelnuts) a day may benefit those who are at high risk for heart disease and type 2 diabetes, a new study has suggested. Scientists have for the first time found a link between eating nuts and higher levels of serotonin in the bodies of patients with metabolic syndrome (MetS), who are at high risk for heart disease. Serotonin is a substance that helps transmit nerve signals and decreases feelings of hunger, makes people feel happier and improves heart health. Cristina Andres-Lacueva and colleagues from the Biomarkers and NutriMetabolomics Research Group of the University of Barcelona in collaboration with the Human Nutrition Unit of the Rovira i Virgili University explained that the rise in obesity around the world means more and more patients have MetS. Symptoms of MetS include excess abdominal fat, high blood sugar and high blood pressure, which increase the risk of developing type 2 diabetes and heart disease. To check the biochemical effects of nut consumption, the researchers put 22 MetS patients on a nut-enriched diet for 12 weeks and compared them to another group of 20 patients who were told to avoid nuts. The scientists analysed the broad spectrum of compounds excreted in the patients` urine and found evidence of several healthful changes. One surprise was evidence that nut consumption had boosted patients` levels of serotonin metabolites in urine. 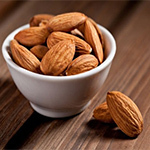 They point out that the study provides the first evidence in humans of the beneficial effects of nut consumption in reducing levels of substances in the body associated with inflammation and other cardiovascular risk factors in patients with metabolic syndrome. The report appears in ACS` Journal of Proteome Research.